The Bengal Tigers were restricted to 91 runs before they were bowled out in 30.3 overs. The Green Shirts chased the target successfully by scoring 93 runs for the loss of five wickets. The match was played at Shere Bangla National Stadium, Mirpur, Bangladesh, on December 1, 2011. Shahid Afridi was unanimously declared ‘Player of the match’ for his all round performance in the match. Bangladesh Captain Mushfiqur Rahim won the toss and preferred to bat on an uncertain wicket. Dashing batsman Tamim Iqbal was back in the side and the jubilant crowd was enthusiastic to witness his powerful strokes. He opened the innings with Shahriar Nafees as the Captain of Pakistan, Misbah-Ul-Haq once again handed over the ball to off spinner Mohammad Hafeez as he did in the Twenty20 match couple of days back. Tamim played three dot balls in the first over of the day but was deceived on the fourth ball and was declared leg before wicket without a run on the board. The home side went back to defensive and even singles were hard to come and by the end of five over they managed just two runs. Pakistani bowlers were penetrative and went through their top order in no time as the home side had lost five wickets for mere 31 runs. Shakib Al Hasan tried his best to consolidate the innings but the wickets kept on tumbling at the other end. 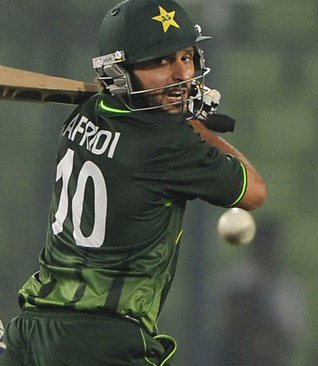 The rival spinners created lot of difficulties for the batsmen and especially Shahid Afridi was unplayable. Shakib lost his wicket after scoring 15 runs and later Nasir Hossain showed some resistance by contributing 21 runs before their innings was wrapped up at 91 runs with 19.3 overs still left in the innings. Boundaries were hard to find in the entire innings and they could dispatch just 7 fours but without a six. Afridi was the star performer with five wickets while Hafeez, Umar Gul, Shoaib Malik, Saeed Ajmal and Aizaz Cheema shared one wicket each. The target looked quite easy for Green Shirts keeping in view their strong batting line up. They initiated the innings well with their regular openers Mohammad Hafeez and Imran Farhat who gave them a reasonable start. Hafeez was aggressive of the two and availed all scoring chances and sent the ball across the boundary quite often. Imran Farhat was dropped by Nasir in the first slip on the first ball of the ninth over but he could not capitalize and lost his wicket in the very next over at 12 runs. The first wicket was gone at 36 runs and Hafeez also followed after the addition of just 6 runs in the total. Younis Khan was unlucky to be given out caught behind by Mushfiqur off Shakib for just two runs while the replays proved the ball did not touch anything. Pakistan seemed in panic at that moment and lost five wickets at 63 runs in 17.4 overs and the crowd was thrilled again. Misbah-Ul-Haq was joined in by Shahid Afridi and they held the game together with positive approach. Afridi came out of his shell and smashed three consecutive fours to Shakib in the 24th over and released the undue pressure. The duo saw them through to the victory once Afridi dispatched a four on the fourth ball of the 26th over. Pakistan won the match convincingly by five wickets and that was their 20th consecutive victory against Bangladesh. Pakistan is 1-0 up in the series and the second ODI will be played on December 3, 2011, at the same venue.